Ulrich Dietz, born in 1958, founded the internationally leading IT service provider GFT in 1987 and has been Chairman of the Executive Board of GFT Technologies AG since its IPO in 1999. The GFT Group currently employs around 1,200 full-time and around 1,500 freelance employees at 20 locations in seven countries. In 2009, GFT’s turnover totaled approx. € 220 million. Ulrich Dietz studied mechanical engineering and product engineering at the university of Reutlingen and Furtwangen and graduated as a certified engineer. He is the co-founder of the Transfer Centre for Information Technology (TZI) at the Steinbeis Foundation for business development. Apart from his function as CEO of GFT Technologies AG, Ulrich Dietz is active as a member in international boards. 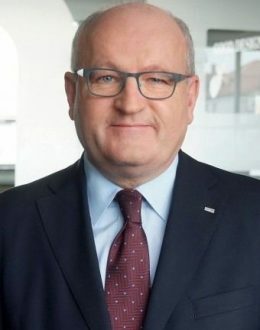 In 2003, Ulrich Dietz became a member of the Presiding Committee of BITKOM (the German Association for Information Technology, Telecommunications and New Media). In this role, he is particularly committed to the promotion and the expansion of international relations in the German IT industry. Furthermore, he is a member of the task force which represents “ICT country Germany and innovative business applications” within the scope of the federal government’s National IT Summit. Within the framework of his activities it is Mr Dietz’s main aim to improve Germany’s position as an innovative country, as well as to promote entrepreneurship in the area of ICT.